A new season of winter citizen science is about to get underway. Shapleigh School is an active participant in the Project Feeder Watch program sponsored by Cornell Labs. We have gotten some amazing donations of bird feeders from the community. Now we need to feed our feathered friends. We are currently accepting any and all donations of bird seed. You can help to support this program by sending in donations of bird seed. Donations can be turned in at the office or given to your child's homeroom teacher. 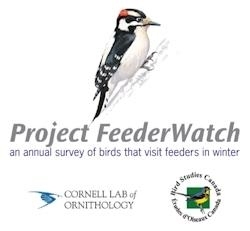 "Project FeederWatch is a winter-long survey of birds that visit feeders at backyards, nature centers, community areas, and other locales in North America. FeederWatchers periodically count the birds they see at their feeders from November through early April and send their counts to Project FeederWatch. FeederWatch data help scientists track broadscale movements of winter bird populations and long-term trends in bird distribution and abundance."